› Author AffiliationsThis work was financially supported by ACT-C (JPMJCR12YO) from JST, and KAKENHI (25713002, 17H03025, and JP16H01043 in Precisely Designed Catalysts with Customized Scaffolding) from JSPS. NK thanks The Naito Foundation for financial support. This short review provides an overview of 7-azaindoline auxiliaries in asymmetric catalysis. 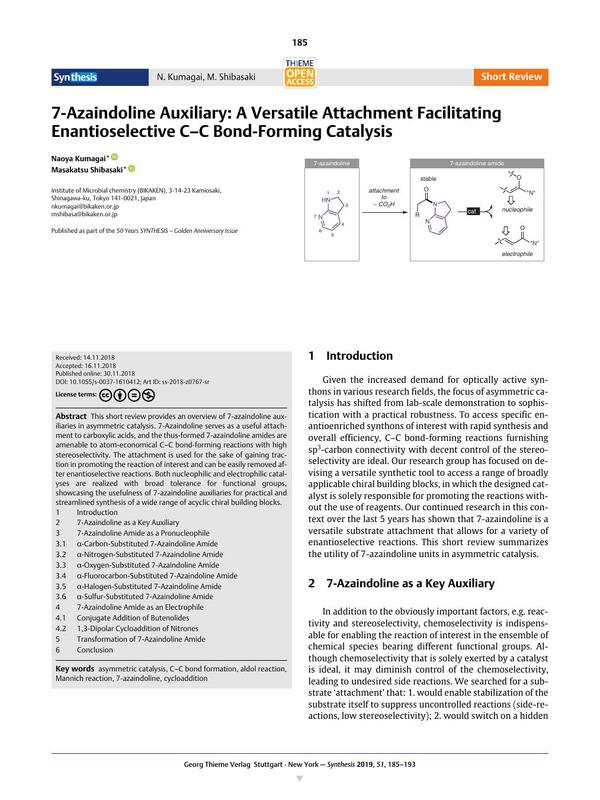 7-Azaindoline serves as a useful attachment to carboxylic acids, and the thus-formed 7-azaindoline amides are amenable to atom-economical C–C bond-forming reactions with high stereoselectivity. The attachment is used for the sake of gaining traction in promoting the reaction of interest and can be easily removed after enantioselective reactions. Both nucleophilic and electrophilic catalyses are realized with broad tolerance for functional groups, showcasing the usefulness of 7-azaindoline auxiliaries for practical and streamlined synthesis of a wide range of acyclic chiral building blocks.